For personalVPN PRO customers we recommend setting up with OpenVPN for best security & flexibility. OpenVPN is harder to block in most cases, and more resilient to internet hiccups. Now that you’ve downloaded your config file, click here to Open Google Play and download/install the OpenVPN app for Android. Once the app is installed, it will automatically search for .ovpn files on your device. 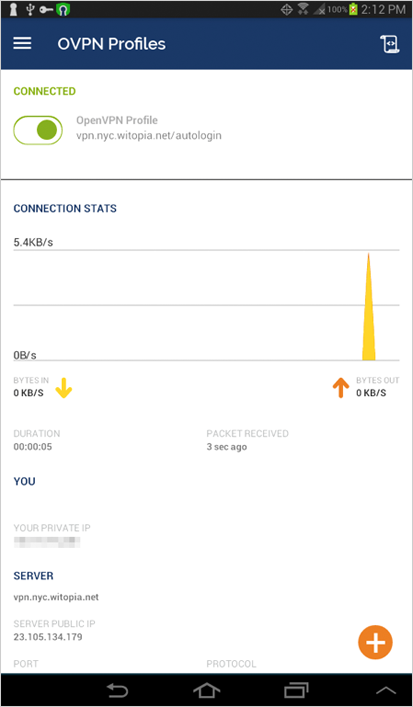 If you get the following screen, click OVPN Profile. Tap to select the configuration file you wish to import, and then tap IMPORT. Once you’re successfully connected the slider turns green. You get a CONNECTED status, and a key/lock symbol in the top left of your notification bar. To disconnect, just tap the slider again. If you wish to add more profiles, simply tap the menu icon in your OpenVPN app, and tap Import. You can also tap the orange plus sign in the bottom right.